Hazardously funny mayhem is in store when Henry vows to win the class football match by any means – fair or foul! And you can chuckle at even more awful antics when Henry gets his mitts on Perfect Peter’s secret diary, and has a face-off with his old enemy Bossy Bill. Three stories in one screamingly funny book to make you howl with laughter, starring the tiniest terror around! I think that this a good book for boys. henry has a chance to win a ticket to a football mach if he wins the one ins school but the big quelstion is will he win the footba;ll mach in school? 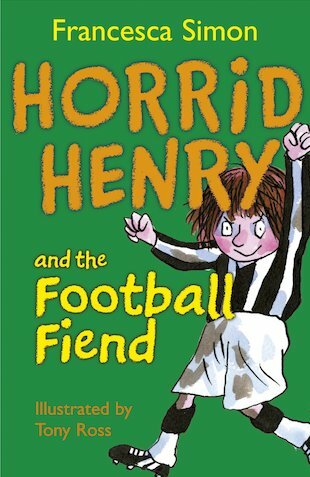 I like this book because it is very funny and he plays a football mach,but who gets player of the mach? When Horrid Henry peeked at Peter’s diary I liked it when he read it because Horrid Henry was relieved that Peter didn’t write anything about him. When Horrid Henry got the diary and changed Peter’s writing and changed his picture of Miss Lovely into something else. It’s a funny book that I think boys should read.